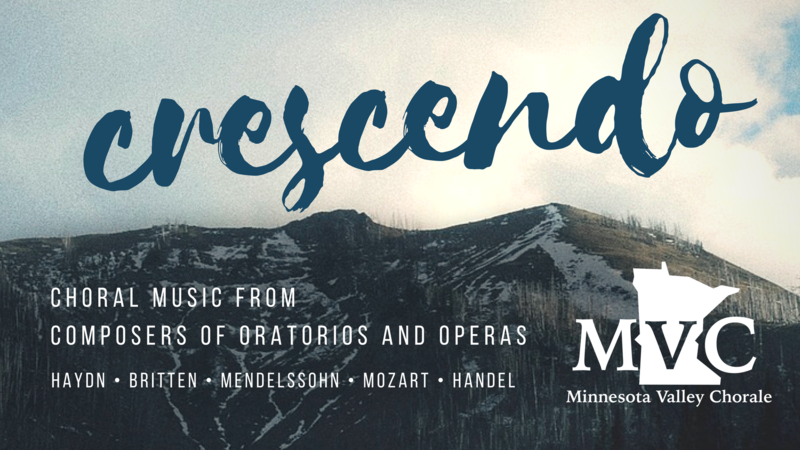 The Minnesota Valley Chorale will host their Spring concert “Crescendo”, featuring music from composers of oratorios and operas. Selections will be performed from Haydn’s Creation, Mendelssohn’s Elijah, Handel’s Messiah, Mozart’s Requiem, and Benjamin Britten’s Rejoice in the Lamb. Concerts will be performed on Friday, April 13 at 7 p.m. at the Catholic Church of St. Peter, St. Peter, and on Saturday, April 14 at Bethany Lutheran College, Trinity Chapel, Mankato. Visit our ticketing page for more information on how to get tickets, or order tickets directly from our Eventbrite page. Tickets are also available from any chorale member. Advance tickets are $10; tickets at the door are $12. The Minnesota Valley Chorale is a group of dedicated vocalists from the Mankato and the surrounding communities. Members of the Chorale come from many different backgrounds and occupations, with the goal to provide the audience with a rich and varied musical experience that is unique to this area.